I found myself nodding vigorously in agreement with this sentence in your review: “Overall, this appears to be academic posturing…” I’m not sure how broadly you intended your comment but, with some regret, I’m content to take it as an epitaph on the entire book. Reading your description of the Book’s Parts, I felt affirmed; your take on the sense of the book matches my own. I hope readers will appreciate how you gave Leveson’s noble intentions a chance in the foreground before circling back to her most troubling assertions. Already by page 9, Leveson has looked at the socio-technical divide – so evident in accidents like Deepwater Horizon – and come down of the side of traditional systems engineering “enforced” (her term) by the constraints of behavior-based safety. Technical control modeling, she insists, can be sufficient to constrain Complex, High-Consequence Circumstance institutions from Drifting into Failure. You rightly point to the CAISO experience – it is a fully-realized falsification of Leveson’s control theory – that linear determinist design for equilibrium-seeking control constraints can inform management for situations at and around the boundaries of the design basis. We’ve many other examples that Newtonian modeling of non-linear, far-from-equilibrium poised Systems of Systems doesn’t work – they ignore the externalities and the importance of Resilience on top of classical forward-engineered Reliability. Leveson’s thinking pretty much took shape in the 1990’s after Challenger and before Columbia – while this book didn’t appear until 2011, it is a compendium of much older papers. There is a severe lexicon problem that seems evident after the shift toward human performance as the equalizer in the research of Reason, Hollnagel, Amalberti, and others. Her usage for risk, reliability, control, systems safety, complexity and culture are all shoe-horned back into a familiar world view of the fully forward-engineered artifacts. Her quarrel with the HRO types from Berkeley is also vintage 90’s – I think Weick, Suttcliffe, and Klein had established their value well before the Millennium arrived. This sounds like the micro-economists and the New Keynsian macro-economists; in 2011 the evidence was pretty much in. STAMP and its lexicon are thoroughly Newtonian-Cartesian and that is its downfall. I’ve been reviewing Dana Meadow’s “Thinking in Systems” particularly to confront my ignorance about the challenge of shifting perspectives from Causal Loop Diagrams to Stock and Flow modeling for understanding trends. Eventually I hope to include Agent Based Modeling concepts in some sort of comparative framework – that just seems necessary at this point. In doing so I’m reminded of my early response to the systems thinking aspects of Leveson’s work – it doesn’t seem to get past the reality that system archetypes are useful for understanding Resilience (ebb and flow of critical dependent variables); they perform quite apart from Reliability measures which are the stock and trade of conventional engineering’s contribution. 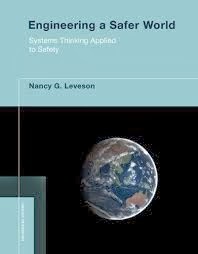 I’m afraid that Leveson’s project goes astray at the Title – it takes a good deal more and different from Engineering.